The Humax HD-FOX T2 was the first Freeview HD box to go on sale in the UK. That was a whole year ago, and even back then, Humax was talking about adding internet TV features including Sky Player and BBC iPlayer via a firmware update. For many who bought that box, or indeed its PVR cousin - the HDR-FOX T2 - the wait has been long and hard. The HD-FOX T2 has since been given magical PVR powers through the use of external storage, and now the wait for IPTV is almost over. While Humax hasn't told us exactly when the TV Portal software will be made available to the public, tomorrow is the one-year anniversary of the release of the T2. Whether that's relevant we're not sure, but either way, we believe the release of the firmware update is merely days if not hours away. As IPTV services on home AV products go, the Humax TV Portal is excellent. We're playing with a late-stage Beta, so it's not quite the finished article yet, but all the same, it works almost flawlessly. The firmware update is applied in the same way as all other Humax firmware updates. You put the 16MB file on a FAT32 USB stick, insert it into the device and restart it with the standby button held in. It took a couple of minutes to install and then the device booted back up again without a problem. For the last year, new Humax remote controls have had a green 'TV Portal' button on them, and this button now has a purpose. A press of the TV Portal button will load up the new interface, and on our T2 it took about 10 seconds to load up properly. Whatever you were watching before you pressed it will continue playing in the top left corner. On launch there are five apps available in the portal - Sky Player, BBC iPlayer, Internet Radio, WIKI @ TV and an unofficial Flickr app. If you press red on this menu you're taken to what's called 'simple mode' where the app icons are displayed at the bottom of the screen on top of whatever you're watching on the Humax box. This is a nice feature as it enables you to launch into Sky Player etc without having to jump through hoops. Obviously in the case of Sky Player you're going to need a subscription, but we're pleased to report that it works perfectly. The first time you load it, you need to enter your Sky Player username and password, but once you've been through this fairly painless process, you won't need to do it again. It takes about 10 seconds to load up the app - presumably the loading time is something that could well be improved with later updates - and once you're in you have access to most of the Sky Player content you have a subscription for. We say most because there are some notable exceptions. Sky One and ESPN are two of the channels mysteriously absent from the EPG. We can access them from our account on a PC or Xbox, so why they're not available on the Humax box we have no idea. We have a full subscription to Sky Player which means we should have access to all channels, but the only ones available to us on the Humax box are as follows: GOLD, Sky Arts 1, Sky Movies Premier, Sky Movies Showcase, Sky Movies Action, Sky Movies Family, MTV, Sky Sports 1, 2, 3 & 4, Sky Sports News, Sky News, National Geographic, National Geographic Wild, History, Eden, Crime & Investigation, Cartoon Network, Boomerang, Nickelodeon, Disney XD, Disney Channel and Nick Jr.
Clearly this limited channel line-up is a bit of an issue for anyone thinking of subscribing to Sky Player especially for the purposes of watching through the Humax portal. We've asked humax for comment and will update you asap on this. "Some channels are still awaiting the rights clearance and they should be available fairly soon. Humax hope to have Sky 1 shortly." Apart from the trimmed list of available channels, the live TV interface is much like you'll find on a regular Sky box. The channel browser is exactly the same, and in fact the only real difference is that it takes around five seconds to change a channel due to the need to load a buffer. 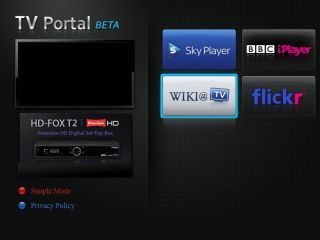 Sky Player is renowned for the picture quality of its live TV, and that quality is retained in the Humax TV Portal app. Clearly it's not up to the standard of Sky HD, but it's only marginally worse than you'd find from a normal Sky satellite box. Even up on a 42-inch plasma it looks great. The same can't be said for the on-demand content, though. Sky Player on PC and Xbox Live has on demand content available at the same resolution as live TV. But we noticed a bit of a drop-off in quality when we switched from Sky Sports 1 to the on demand highlights of the England-Australia ODI match from yesterday. The EPG is also decent, and is displayed at maximum resolution - so if you've got your Humax box set to a 1080p output, the EPG and the rest of the Humax TV Portal interface for that matter, will be sharp as you like.